See also: Daryl Hall solo discography and John Oates solo discography. This article includes the discography of American duo Daryl Hall & John Oates. In the US the band has sold a certified 13 million albums and 6 million singles. US chart positions: Billboard 200; UK chart positions: UK Albums Chart. 2004 Our Kind of Soul 69 86 — Album of cover versions and some original songs. 1989 Special Mix on CD — — — Compilation of the remixes included on singles from Ooh Yeah! 1997 Starting All Over Again – Best of Hall & Oates — — — Double-CD released only in Europe (Originally in Denmark). Reissued in Taiwan in 2002 with same tracks in different order and new cover art. The Ballads Collection – RCA 100th Anniversary Series — — — Includes previously unreleased versions of "Everytime You Go Away" and "One on One"
Starting All Over Again – The Best Of — — — Double-CD released in Taiwan. Originally released in Europe (Denmark) with same tracks in different order and cover art. 2008 Playlist: The Very Best of Daryl Hall & John Oates — — — US-only release including single versions of several hits. Part of Legacy's Playlist series. 2009 Do What You Want, Be What You Are: The Music of Hall & Oates 89 — — 74-track/ 4-CD box set featuring many live, unreleased performances and three songs recorded prior to when Hall & Oates formed as a duo. Do the Things You Do/My Girl]]"
1988 "Everything Your Heart Desires" 3 13 — 2 6 — 75 — Ooh Yeah! "The Woman Comes And Goes"
1981 "Kiss on My List"
1982 "Did It in a Minute"
1985 "Method of Modern Love"
Do the Things You Do/My Girl"
1991 "Don't Hold Back Your Love"
2006 "It Came Upon a Midnight Clear"
^ a b c "Daryl Hall & John Oates – Chart history | Billboard". www.billboard.com. Retrieved 2017-07-08. ^ Roberts, David (2006). British Hit Singles and Albums (19th ed.). London: Guinness World Records Limited. p. 241. ISBN 1-904994-10-5. ^ Kent, David (1993). Australian Chart Book 1970–92. St Ives, N.S.W. : Australian Chart Book. ISBN 0-646-11917-6. ^ a b c Roberts, David (2006). British Hit Singles & Albums (19th ed.). London: Guinness World Records Limited. p. 241. ISBN 1-904994-10-5. ^ "Daryl Hall & John Oates – Chart history". www.billboard.com. Retrieved 2017-07-08. ^ "Chart Search". www.billboard.com. Retrieved 2017-07-08. ^ "45cat – Daryl Hall And John Oates – Discography". www.45cat.com. 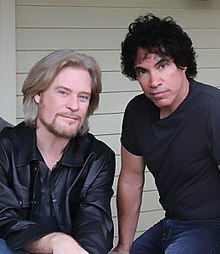 ^ "Daryl Hall & John Oates chart history for Hot 100 Recurrents". Billboard. Retrieved May 30, 2017. ^ a b "Daryl Hall & John Oates – Chart history". www.billboard.com. Retrieved 2017-02-26. ^ "Jingle Bell Rock" did not enter on the Hot 100, but peaked at number 30 on the Hot 100 Recurrents chart on January 1, 2005, it also reached number 6 on the Billboard's Holiday Airplay chart on December 13, 2008 and number 24 on the Hot Holiday Songs chart on December 10, 2011. This page was last edited on 3 April 2019, at 18:25 (UTC).